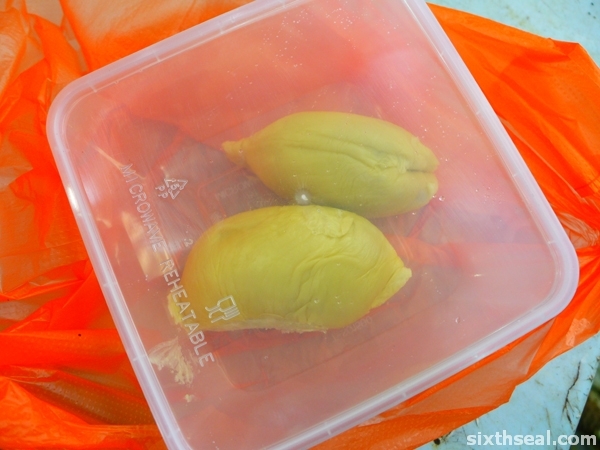 Don’t buy durians at the same time you get your laundry and leave them in the car! I did that while grocery shopping just now and after a (not insignificant) pause, I decided to go for a quick one, grabbing items off the shelves. Yup, my newly laundered clothes were saturated with the smell of the King of Fruits. I’ve decided that I’m not going to sweat the small stuff and see where He wants me to go in 2013. I’m sure there’s a bigger plan for me and I will totally submit myself to it. I also have a few issues that I need His help in resolving but the main thing is to listen to that guiding voice and be nice to people (even if they’re not nice to me, but that’s the point innit? ). 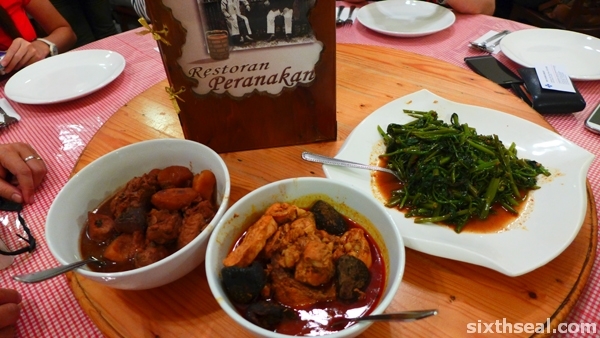 Restaurant Peranakan is the aptly named place known for it’s Peranakan cuisine. 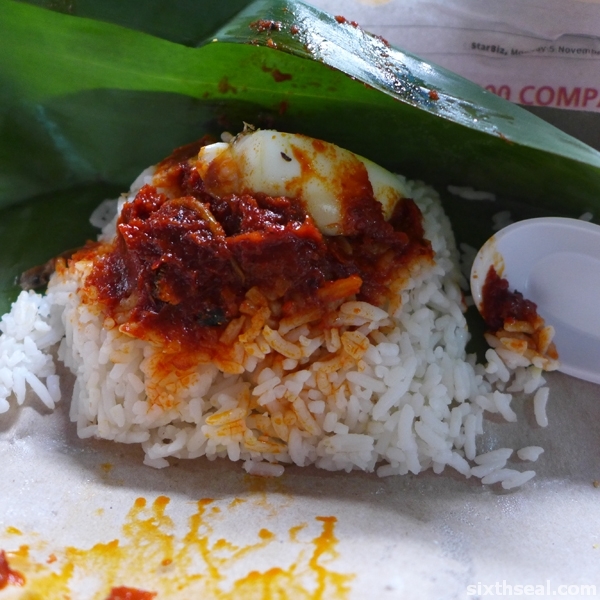 It’s often been cited as the #1 place to go for Nyonya food in Melaka. 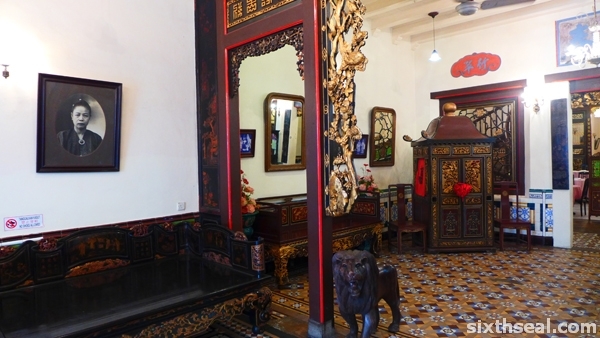 Peranakan (or Straits Chinese) is a distinctive racial group in Melaka – it comes from Chinese settlers marrying locals and is an entire culture unto itself, the hotbed of which lies in Melaka. 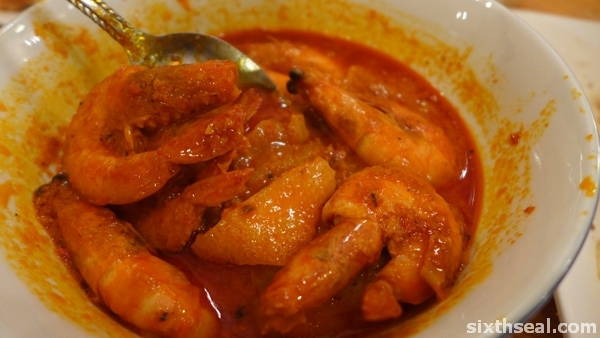 Nyonya food is conglomeration of Chinese and Malay food, but there are some really unique dishes they call their own. I had lunch here while on a road trip to Melaka. 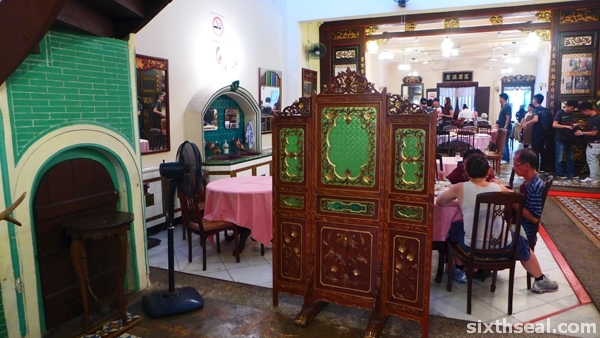 Peranakan Restaurant has a really nice décor which reflects the heydays of the Baba Nyonya clan. 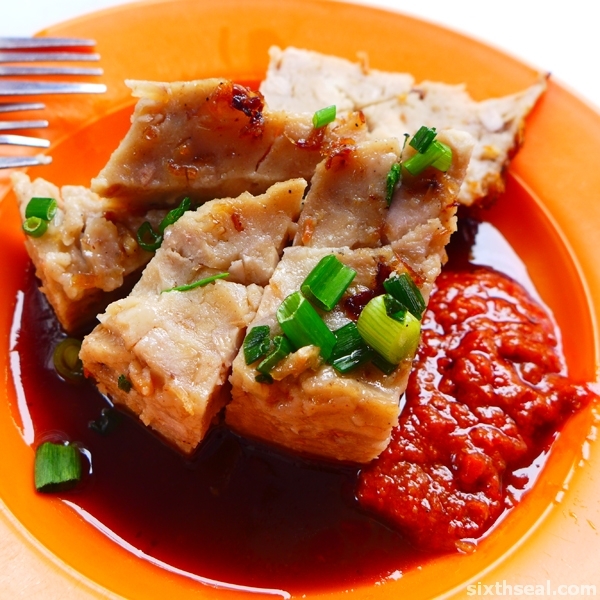 This is perhaps the most well known Nyonya dish. 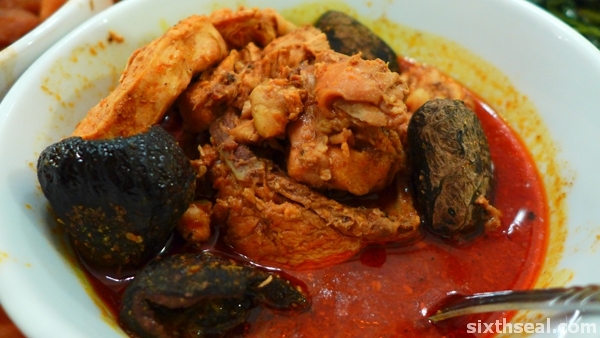 It’s chicken cooked with kepayang tree nuts. 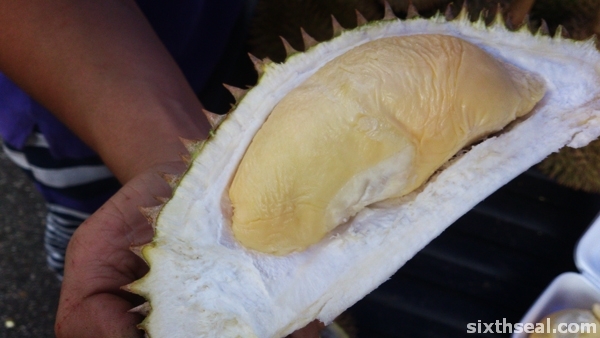 Buah keluak is actually poisonous before being prepared for cooking. 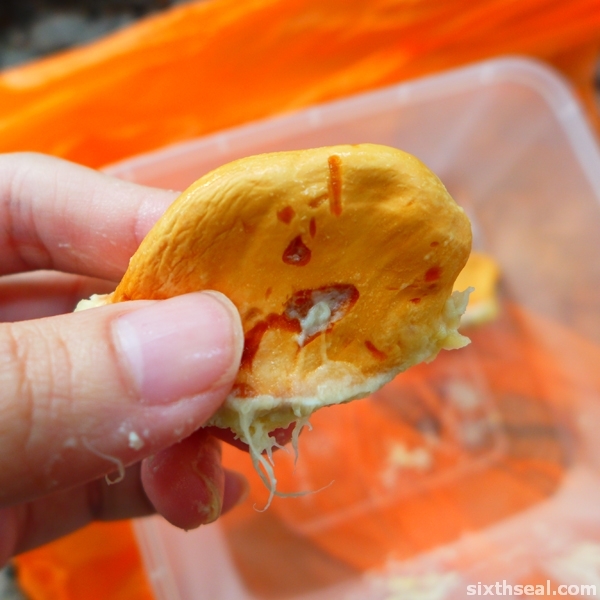 It prompted a lot of Googling when I mentioned that coz someone ate the inside of the nut. 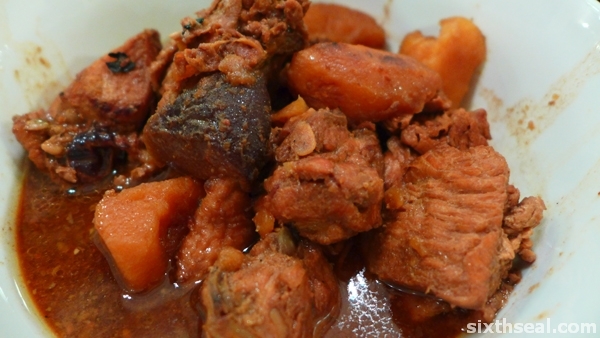 I like this dish – it’s a very rich and flavorful one due to the buah keluak. 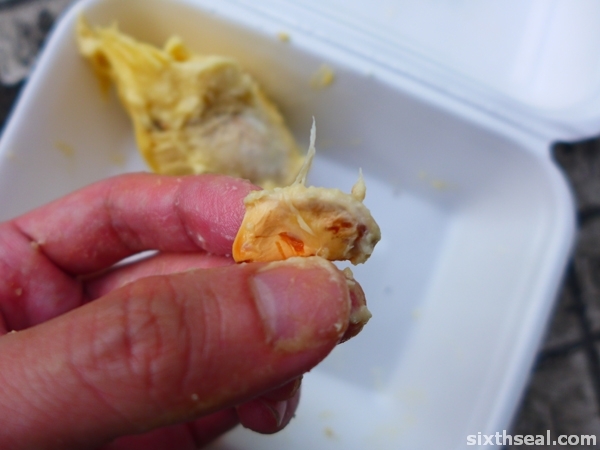 I ate some of the insides of the nuts too – it’s sourish and contributes to the flavor of the chicken. Peranakan Restaurant makes the best ayam buah keluak I’ve had. I’ve had this at Donald & Lily’s Authentic Nyonya Food too but that pales in comparison with Peranakan Restaurant’s version. 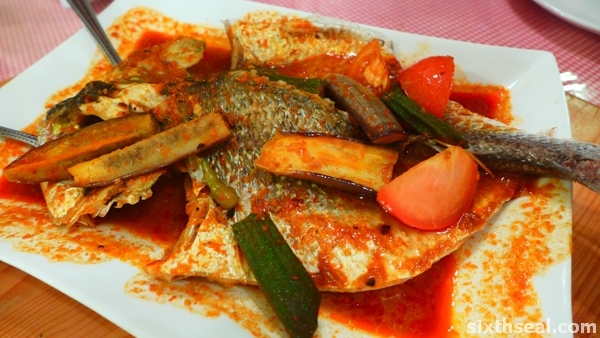 This is a really good and spicy fish dish that I found worthy of mention – it’s cooked with brinjals, tomatos, and ladyfingers and has a sweet, spicy and sour (more towards the latter) gravy that goes very well with rice. 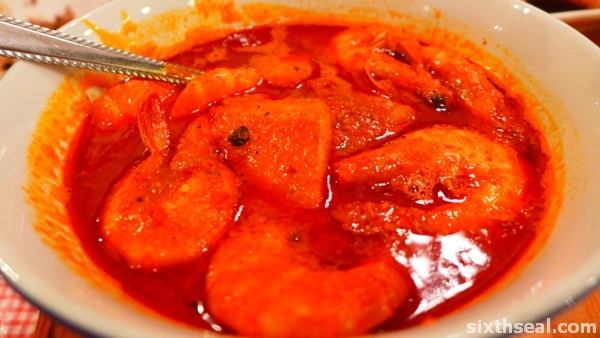 This is a very rich dish of shrimp cooked with pineapples and lots of oil. I set the camera to Vivid and it almost hurts my eye to look at it. 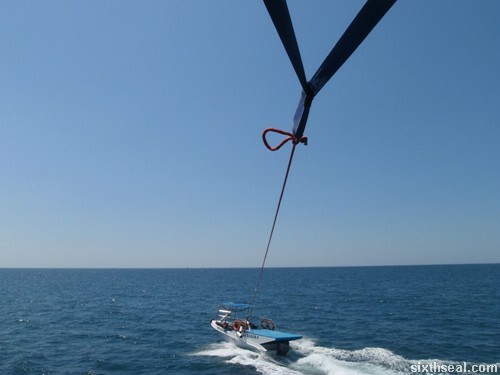 Here’s one that’s easier on the ocular devices. 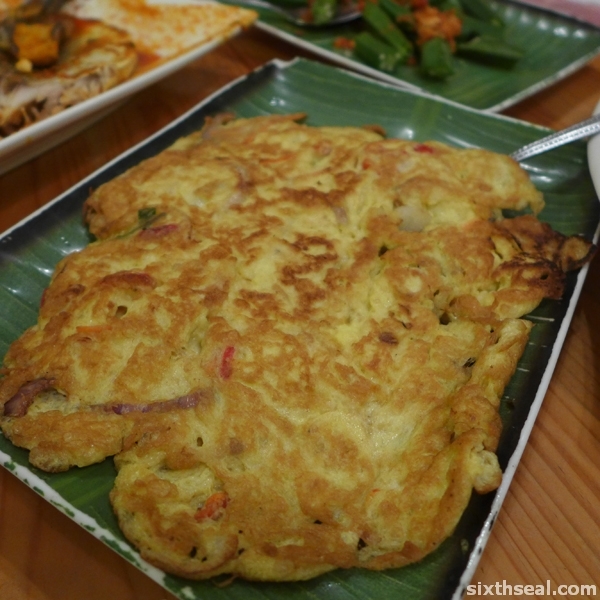 ;) It’s also one of the dishes I’ll recommend at Peranakan Restaurant. It’s mixed vegetables, nothing special here. 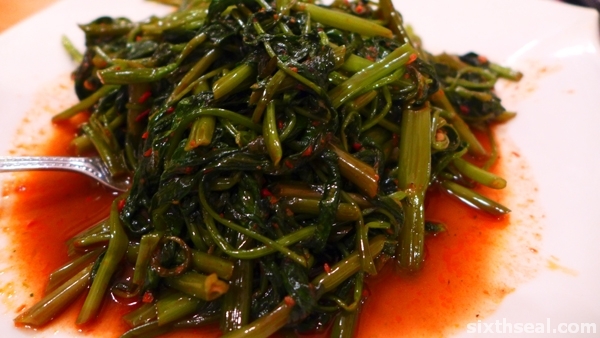 This dish has strayed into mainstream Chinese cooking that a lot of people forget it’s Nyonya origins. If you want the most authentic version, I guess here’s where you go. I think this is the egg omelet unless I’ve completely messed up my bearings. Forgettable. 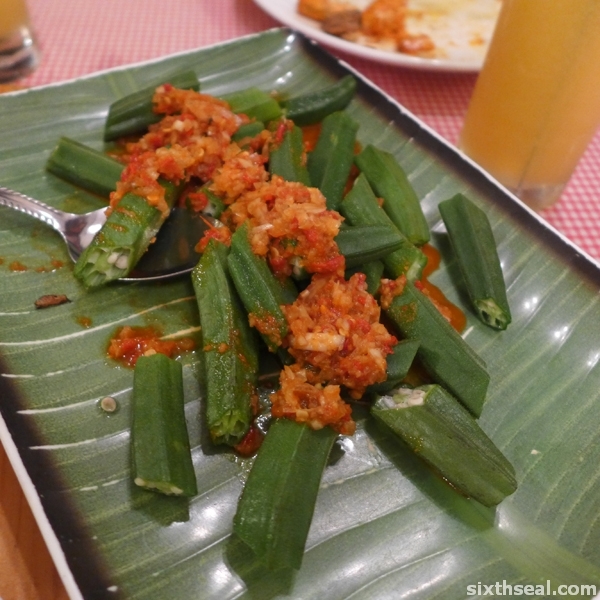 Okra with a splash of sambal on top. Simple, but good. 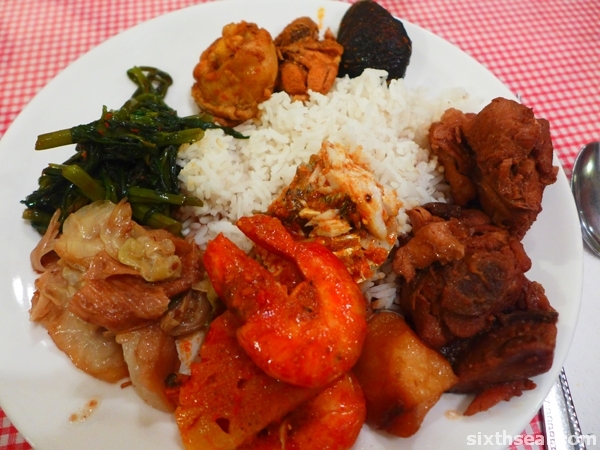 I spent the whole time piling my plate with all the different stuff so I could take a photo. Their flagship dishes are really good, while some are mediocre, but IMHO, Peranakan Restaurant is the place to go for authentic Nyonya food if you’re in Melaka. 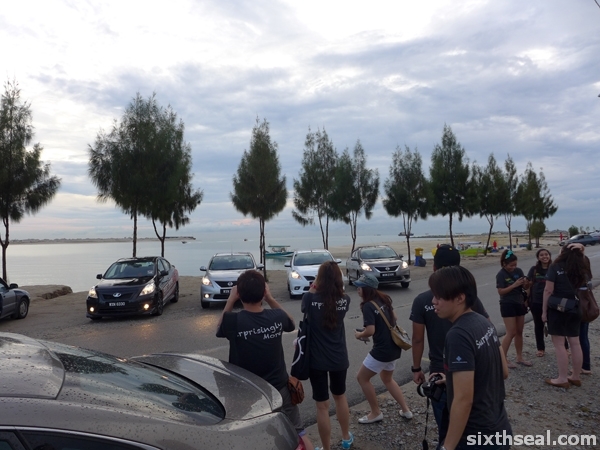 I was there on a the Eat, Play, Drive road trip with a bunch of other bloggers. We drove down on several Nissan Alameras. I had the opportunity to drive the IMPUL tuned one (which is my main ride, with a very auspicious plate too – WXN 6330). Simon, Joshua and Kelly (another group) was kind enough to let me drive the stock Nissan Alamara for a stretch. I prefered the Nissan Alamera tuned by IMPUL that was issued to my group – there’s keyless ignition and the specs are pretty decent. I found the acceleration to be a bit lacking, but as they say, it’s not a sports car, but a sedan that’s surprisingly affordable for its class. I was quite impressed by the price of the car for it’s specs. 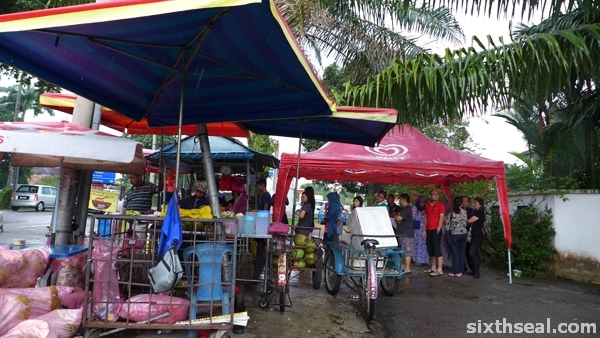 This was also where I had the famous Klebang Original Coconut Shake and while we were driving there, we also stopped by Aunty Koh’s Cendol. 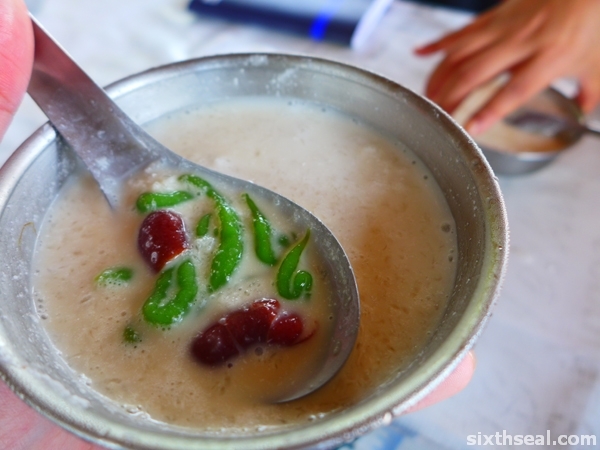 This place churns out really good cendol – perfect for a hot day! 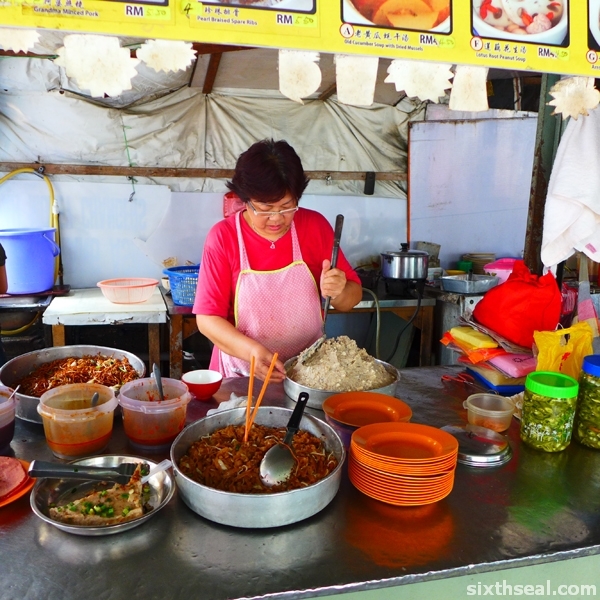 It’s primarily manned by a single woman – the aforementioned Aunty Koh. 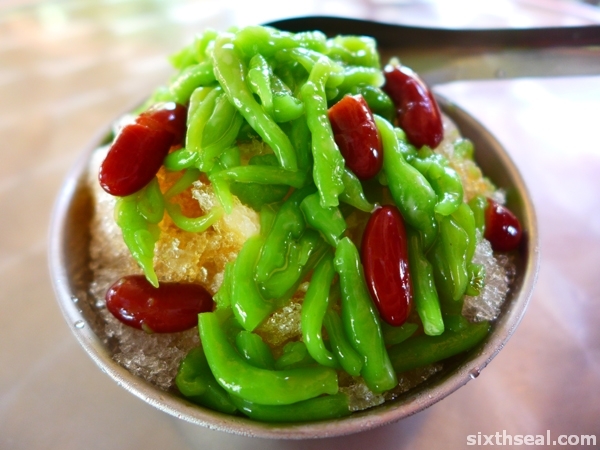 Cendol is a shaved ice dessert with squiggly green jelly and kidney beans (we use red beans in Sarawak). 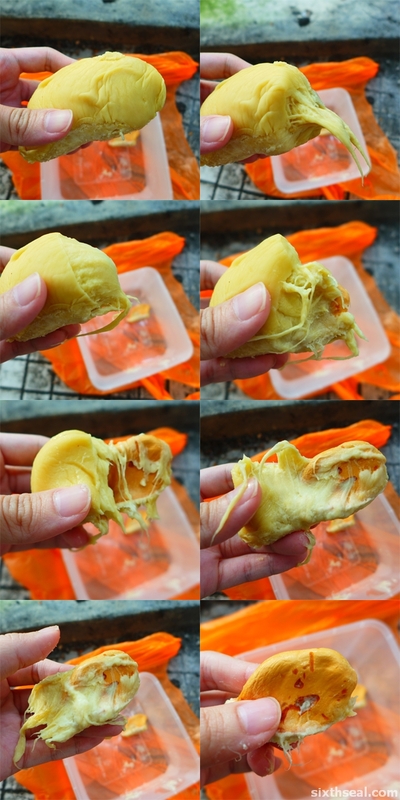 Gula Melaka (caramelized palm sugar) gives it that distinctive sugary sweet taste, which is tempered by santan (coconut milk). 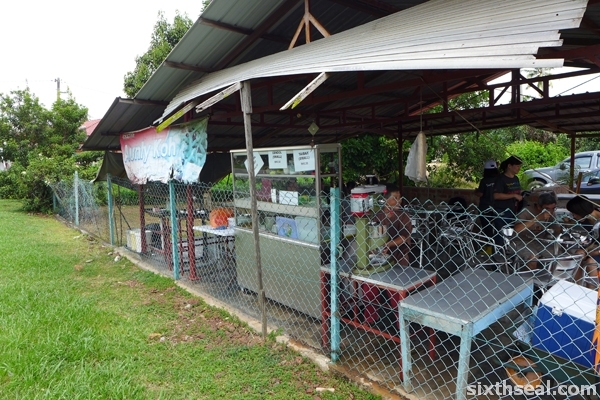 You’ll be amazed by how many people come here for the RM 3.50 (large) cendol. 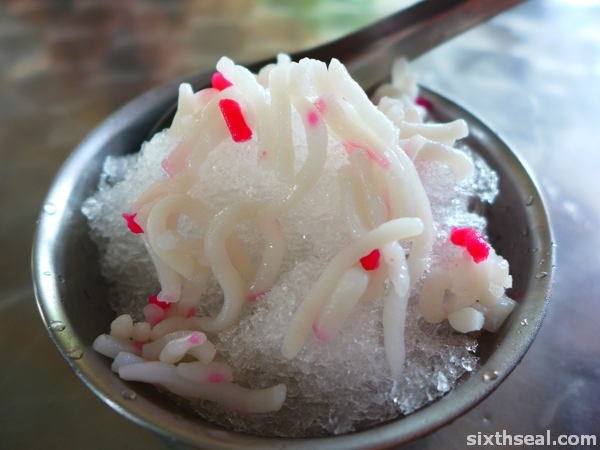 I was tempted to have two (and I think I did have two) but I also heard that this place is famous for it’s taibak (RM 1.50) – which is a very simple shaved ice dessert made with red and white flour squiggles. 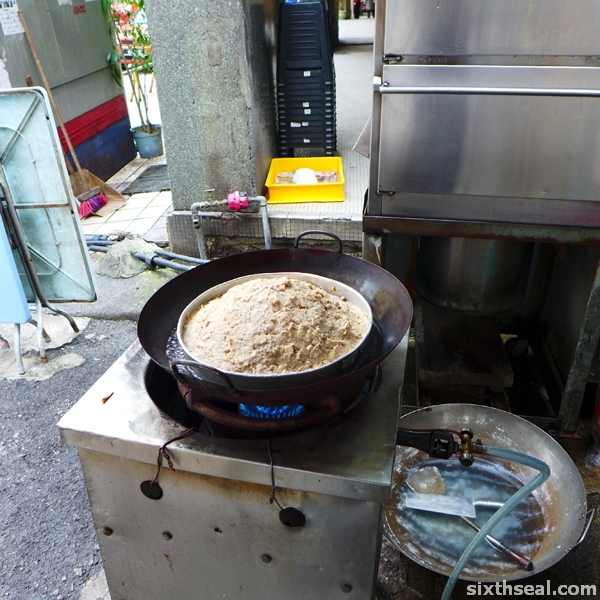 I found the taste very similar to something we have in Sibu called “wu wei tang” (5 taste soup) which is another shaved ice dessert that has dried apples and other misc ingredients among it. 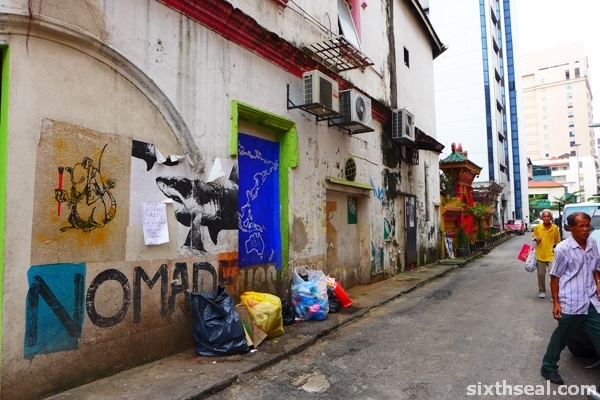 I’ve never actually walked around this part of KL. I’ve driven through it often enough but never stopped and checked out the food. Joyce was telling me that she saw a lot of stalls there a while back with Shin. This area is where the really old pre-war shoplots are at. 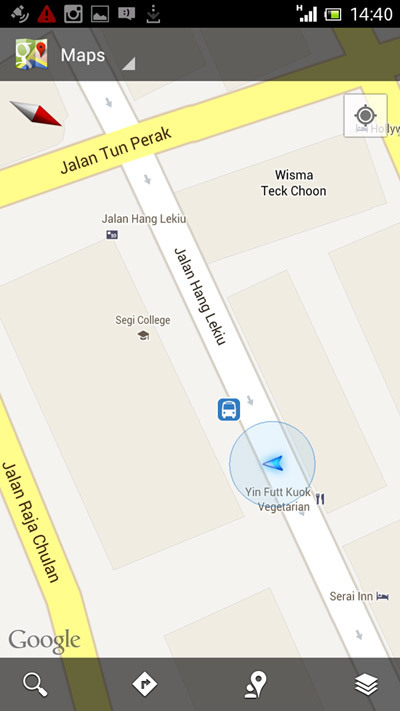 I’ve had a steak dinner around the area at Ril’s Steakhouse at Jalan H.S. Lee but this time we’re out to investigate the little lanes around the area – essentially playing tourist, which is kinda fun. 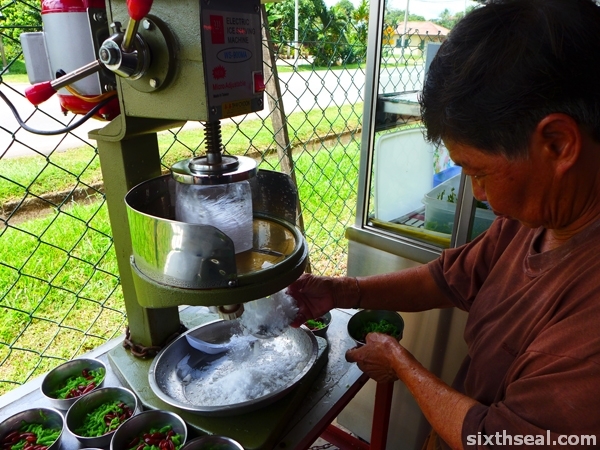 I came across this auntie exerting herself mixing a batch of gooey stuff at Lorong Bandar 4 and asked her if I could have some of that. I was quite taken aback when she said NO! 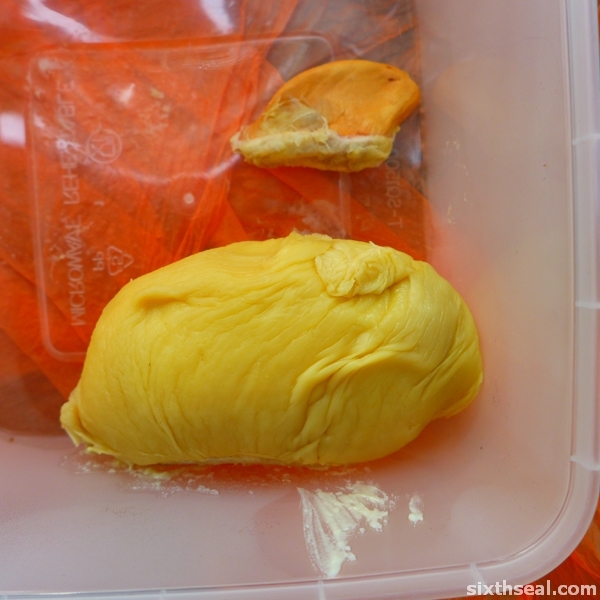 It turns out that this is a batch of yam cake (oh kueh) that’s still uncooked. She said it’s for tomorrow and promptly put it into the a home rigged steamer with a wok. 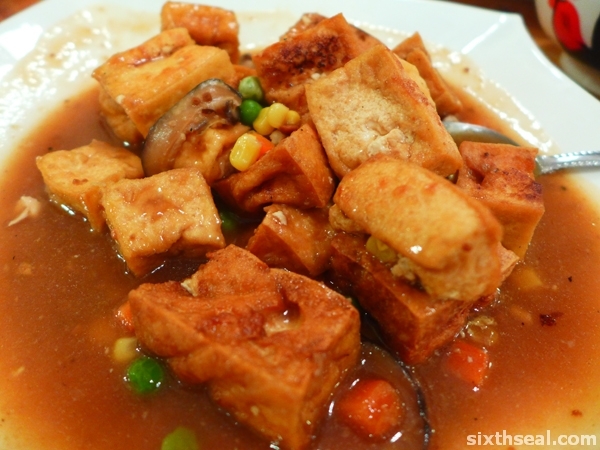 I ordered a portion of the (cooked) yam cake for just RM 2. 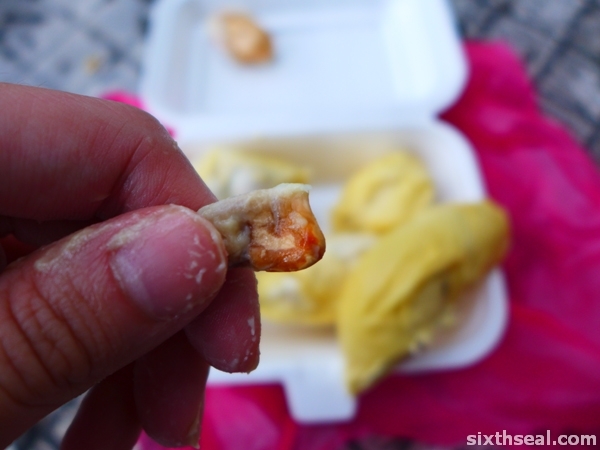 It’s quite good when eaten with the (optional) chilli and sweet sauce. It’s a good find (also found a better unnamed shop) and goes to show that driving around and just stopping somewhere unfamiliar for an afternoon can be quite a fun afternoon in itself. …and speaking of driving around town, here’s a short mention about the new Rio and an awesome contest where you can actually win the car by solving word puzzles! 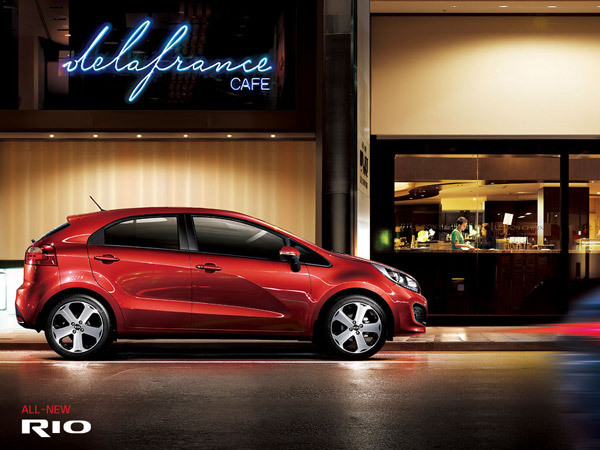 The all new Kia Rio is a 1.4 cc compact 5-door hatchback that comes in two variants. It’s an award winning design that has a sporty profile from the low roofline combined with a special ratio of metal and glass. It’s a great looking car with a distinctive wedge that you’ll recognize instantly. Do you fancy yourself a word smith? Good with puzzles and all that? Always the winner in Scrabble? 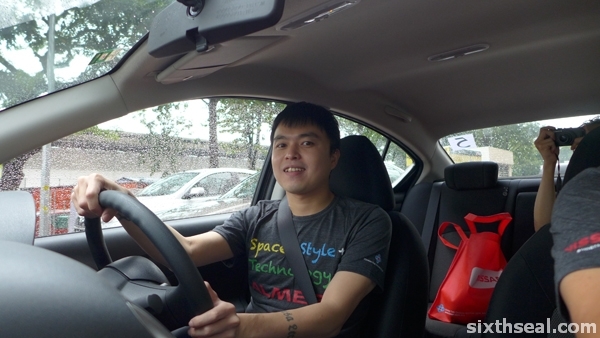 You can win yourself a Kia Rio by solving word puzzles in the Runabout contest on Facebook! 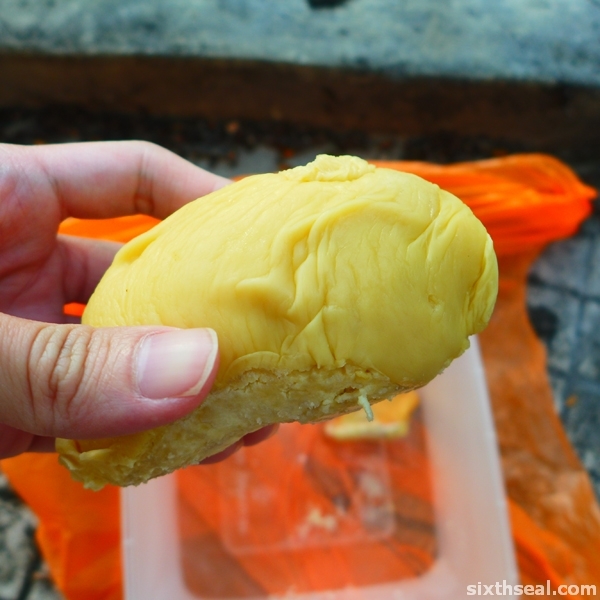 Durian jantung (heart shaped durian) – genuine species or description? 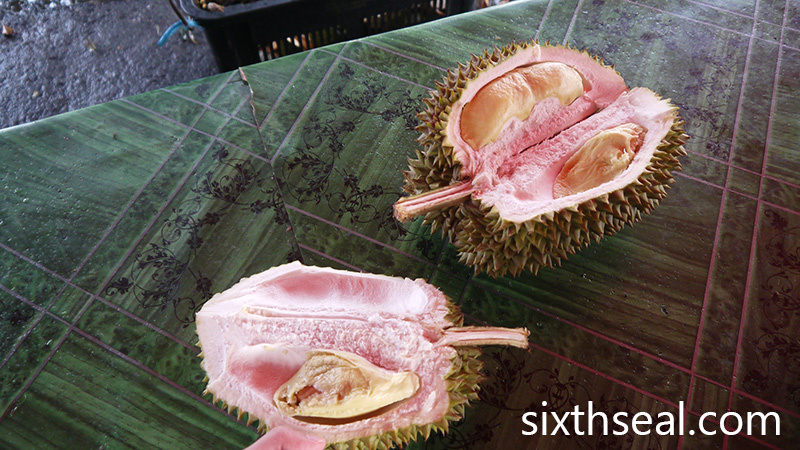 I was trawling the SS2 durian spots the other day, asking around for something a little different. 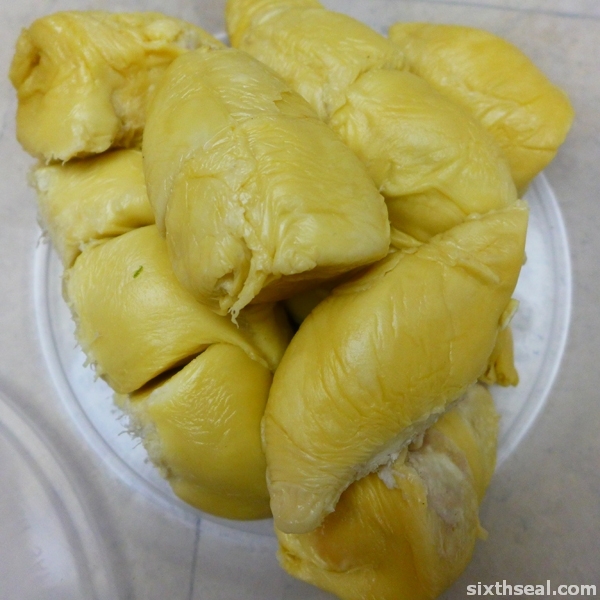 I wanted to sample something other than the usual Musang King/D24/XO/D101 etc. The usual suspects, in other words. 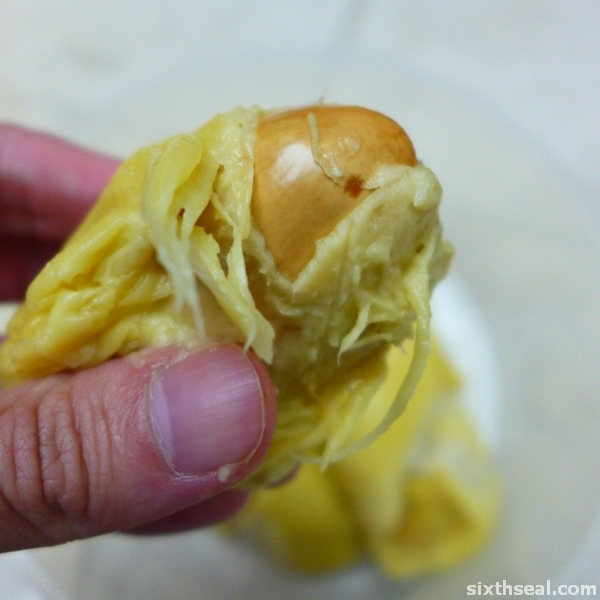 One seller told me about durian jantung. I asked around a few shops in the area – some of them carry it, some doesn’t. 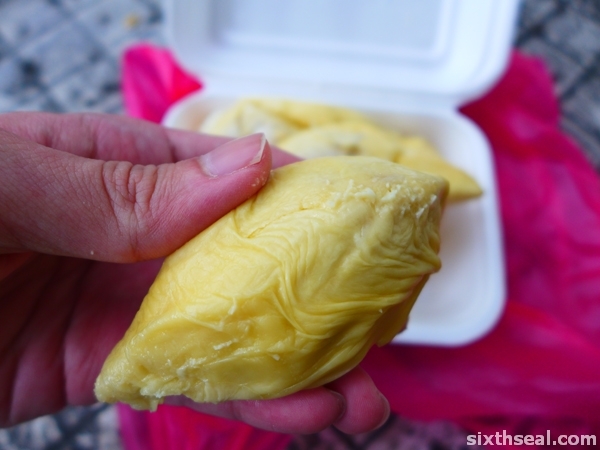 It would seem that “durian jantung” literally means “heart shaped durian”. Not heart as in <3 – heart as in the organ in your body that’s prone to cardiac arrests. 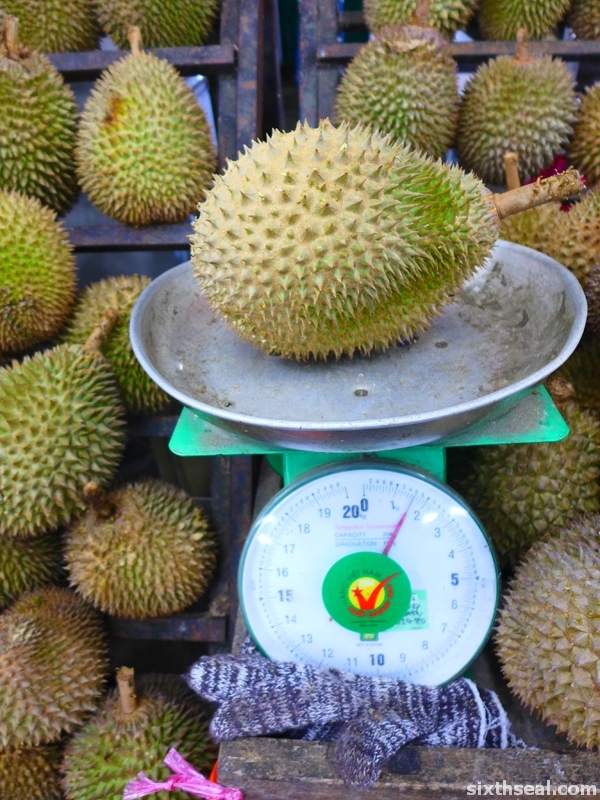 What no one could tell me is whether this is a genuine species (it doesn’t have a D-X classification, but neither does multiple other good durians) or just a type (e.g. 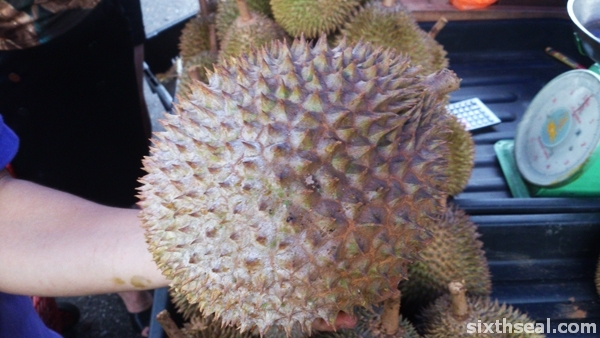 shape) of durian. 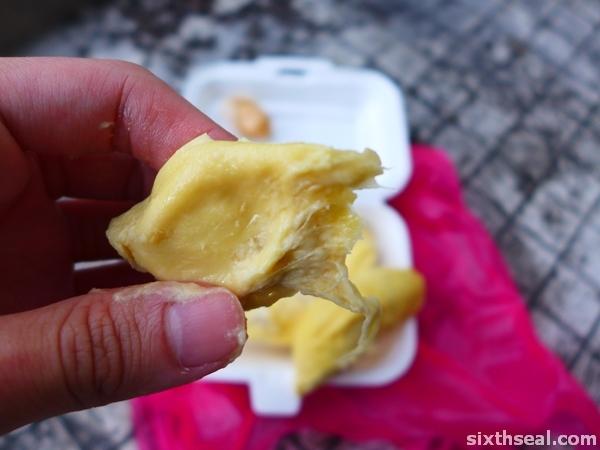 Durian jantung is a really interesting durian – I was quoted RM 12 / kg which is a little on the high side of things. 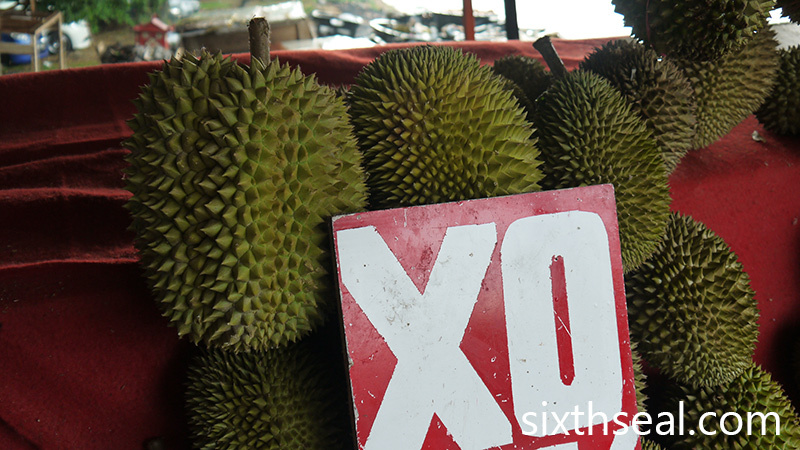 I bargained down to RM 10 / kg and that was the minimum price they’ll let it go…and with good reason. It doesn’t look like much. 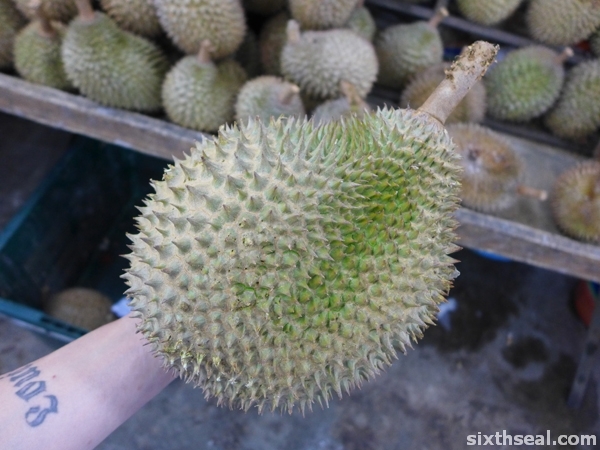 I bought a 1.6 kg heart shaped durian that when opened produced only two (2) seeds! I was surprised. That works out to RM 8 per seed! 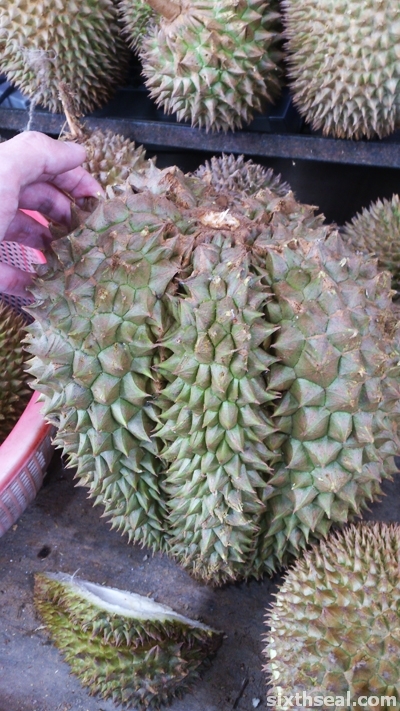 I was told that durian jantung usually only has 2 seeds due to the unusual shape, but those are huge seeds and I wasn’t disappointed. 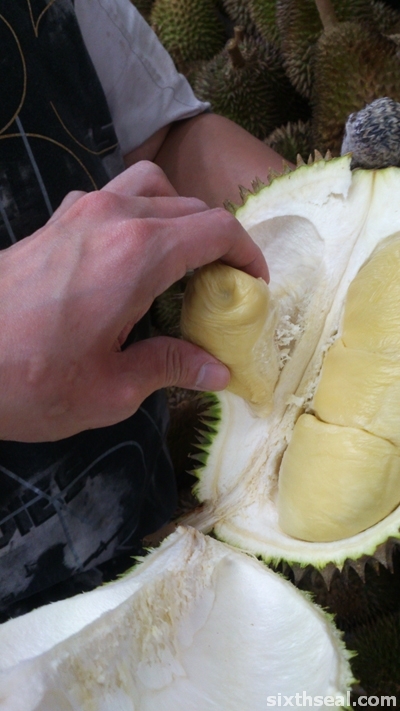 …and now imagine it FULL OF DURIAN FLESH! There’s only a tiny seed inside. It’s maybe 1/30 the size of the flesh. 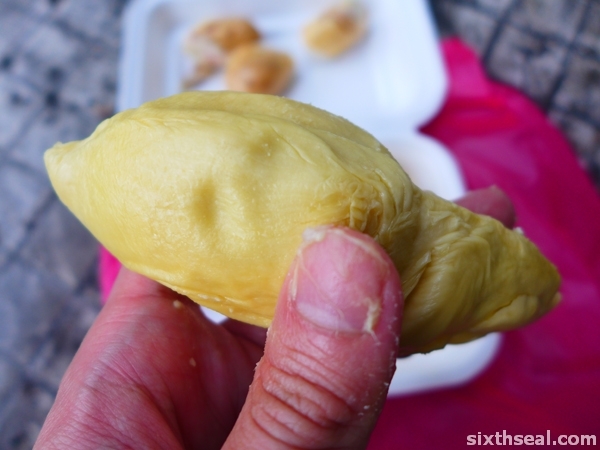 It’s absolute value for money, RM 8 buys you a gigantic fist sized hunk of light fibrous, sweet to slightly bitter-sweet, semi-alcoholic, and slightly wet durian flesh. 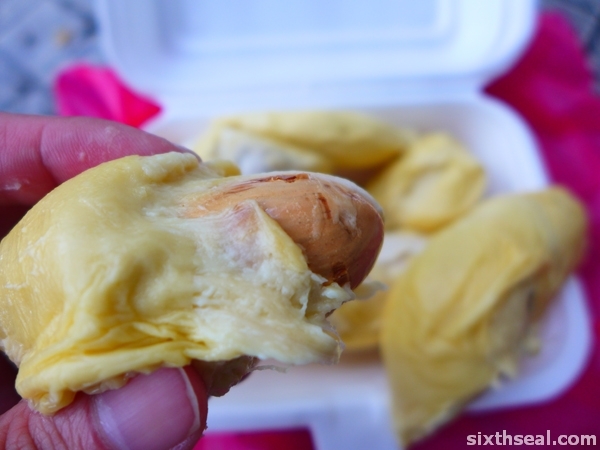 Durian jantung is my new favorite durian. 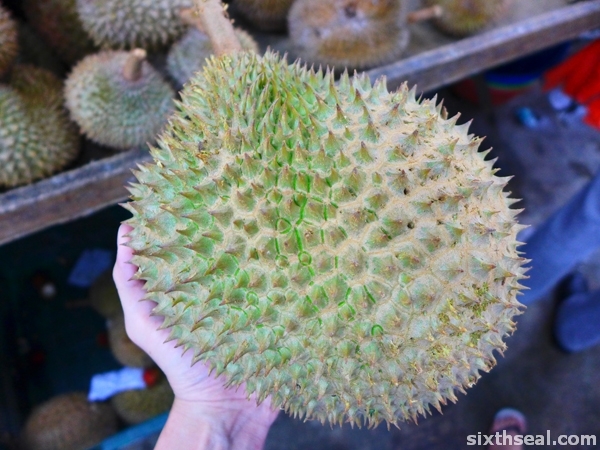 I paid RM 16 for the entire 1.6 kg durian which produced just 2 seeds but the flesh is equal to many other popular strains and it tastes fabulous! 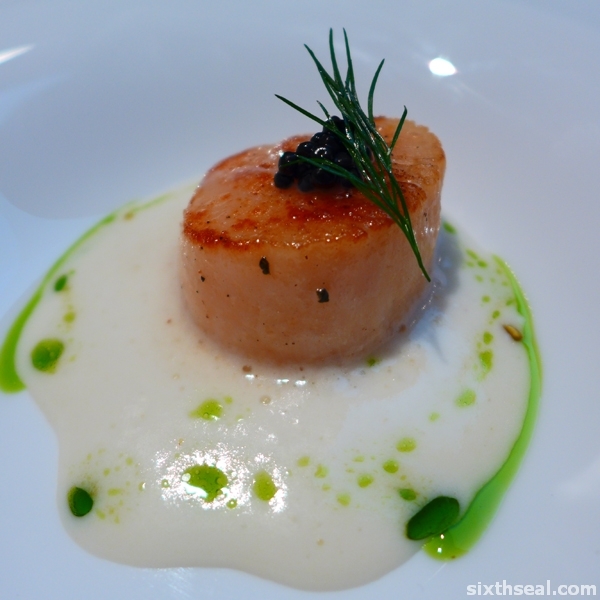 Senja is an Italian restaurant despite it’s Malay sounding name. 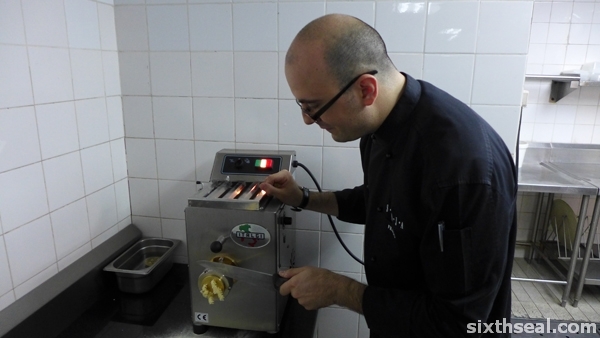 The food is prepared by Chef Filippo Giunta, a friendly Sicilian which I got to meet later. It is best known for it’s homemade pasta and pizzas (they even have a firewood oven) and the ambiance – it’s built on stilts above a man-made lake and the view is quite pleasing. I was there to check out their Christmas Eve Dinner. I haven’t been here for a while and I thought I’ll come and check out their new pasta machine. 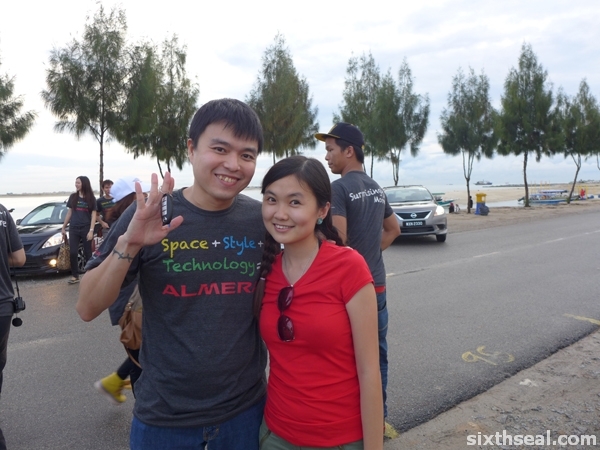 Thanks for the invite Azimy and Azirah and it’s a pleasure to meet you Karen! The five course meal was preceded by their wonderful home-made bread, which I absolutely loved. 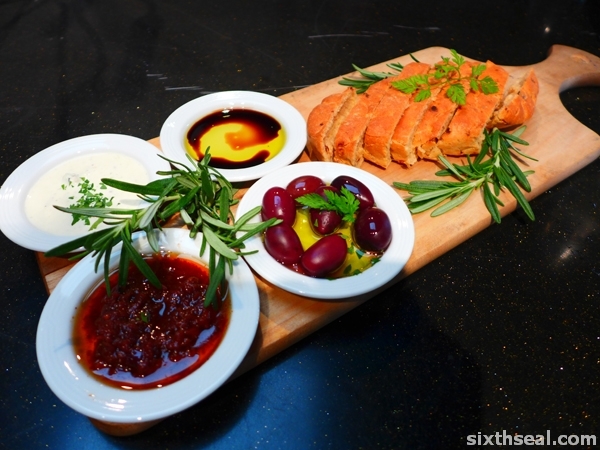 It came with four different types of dip – the whole olives and sun-dried tomatoes being two of my favorite. This is the first course proper – the amouse-bouche. 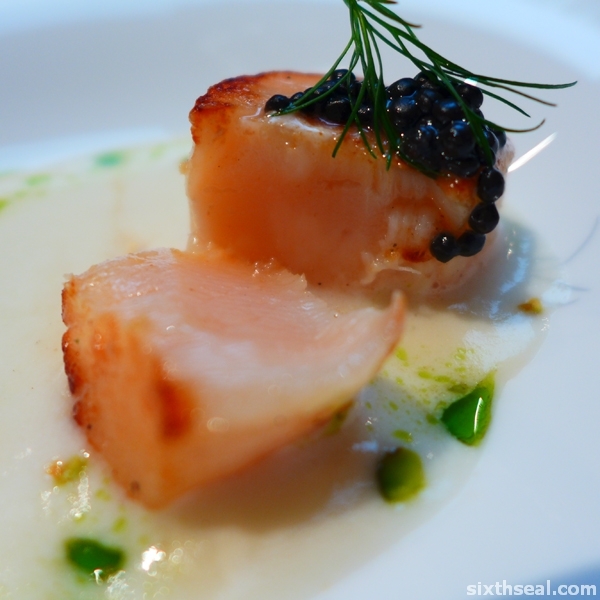 It’s a nicely cooked piece of scallop topped with black caviar with potato mousse and dill oil. I thought it’s a nice start for the Christmas Eve course. I really, really liked this. 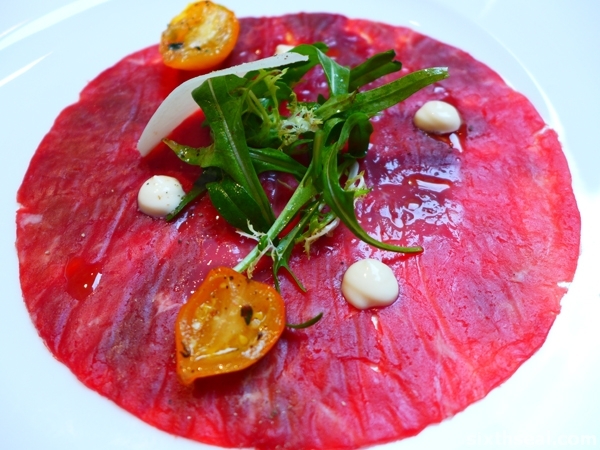 The circular tissue-thin Black Angus is aged well so you can taste the intense flavors in this apt appetizer. I wish I could have more of this. Perfectly dry-aged (I think, forgot to ask) beef. This would be my recommendation for the main course if you’re not one of those people who must have turkey on Christmas Eve. I’ve seen how they make their pasta in-house and the linguine is cooked to perfection – dictionary definition of “al dente”. 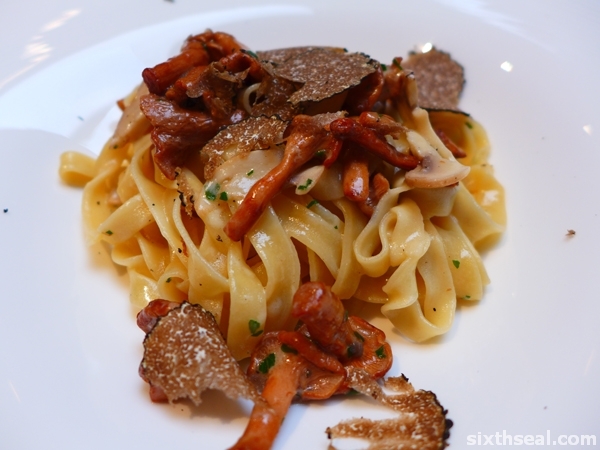 I enjoyed the simplicity of the dish, spruced up by generous shavings of black truffle. 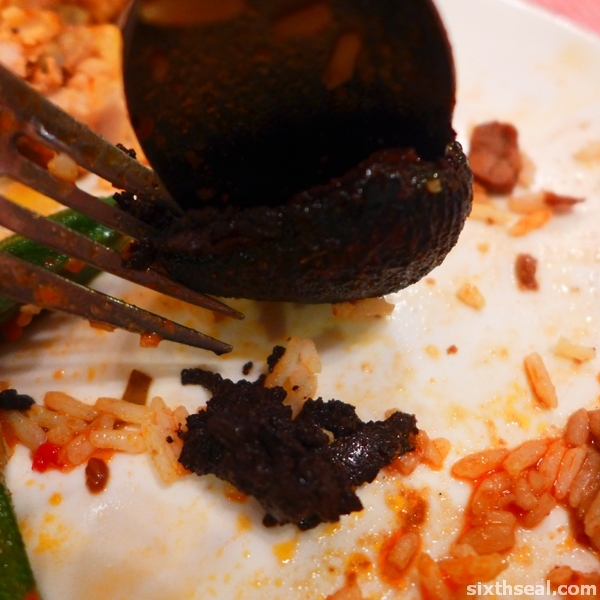 There’s nothing wrong with this dish, but it didn’t quite hit the spot for me. 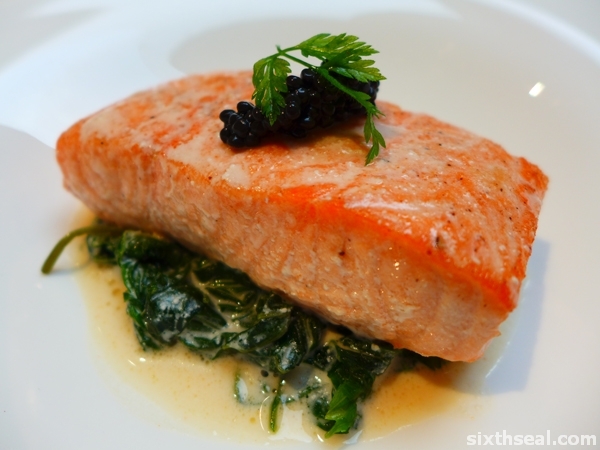 It’s a generous slice of salmon on top of spinach and it was the first main dish that I ate but I felt that the salmon overpowered all the other flavors in the dish and it was a tad overcooked but then again I won’t pretend to be a food critic. Heh. 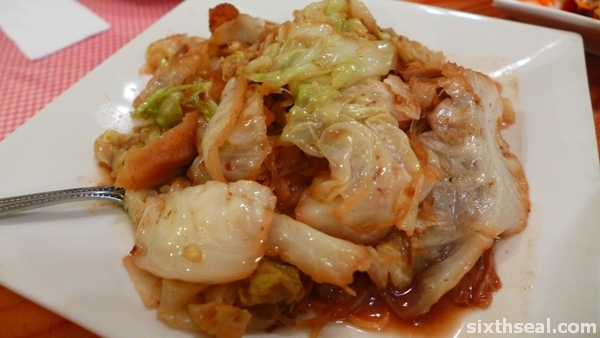 I just felt that the other two dishes were much better. This is hands down the best dessert I’ve had this month, or maybe even this quarter. I might even hazard to go “this year” due to this wonderful creation from Chef Filippo Giunta. It’s not a regular tiramisu made with Savoiardi – that has been made passé with this “tiramisu” made from Panettone. Just think of Savoiardi being substituted with Panettone Antica Ricetta and you’ll have an inkling of what this marvelous dessert tastes like. This is the Panettone used for the Christmas Eve Dinner dessert at Senja. It’s the specialty Christmas cake of Milan which traces its roots to an ancient Franciscan cloister in Saronno. It’s orgasmic – there’s a bit of fruitcake to remind you of the festive season and I was very impressed by this dessert. 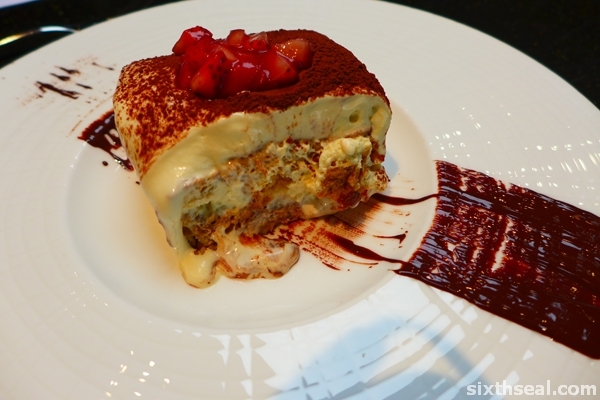 The Mascarpone and coffee cream slathered on top of this Panettone “tiramisu” takes the cake (haha). I’ll go just for this dessert again! We also had mince pies, biscuits and gingerbread cookies after the meal and I was so enamored by the Panettone “tiramisu” that Chef Filippo Giunta came out with what the dome-shaped Christmas cake. 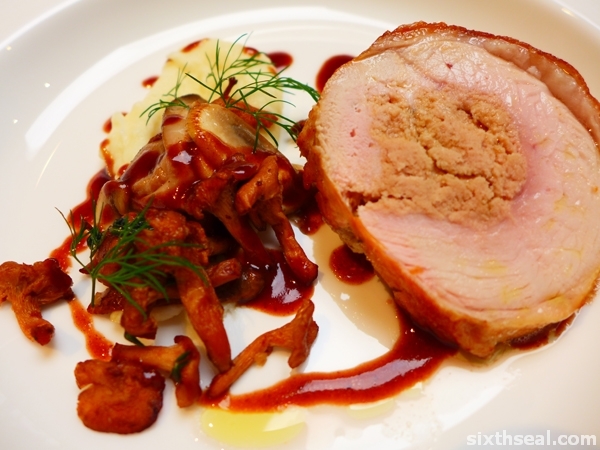 The Christmas Eve Dinner at Senja, Saujana Hotel is priced from RM 160++ to RM 280++ with optional wine pairing. 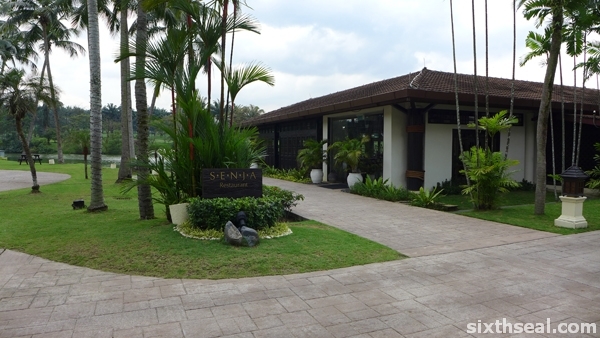 They also have a New Year’s Eve set dinner priced at the same range where you can watch fireworks by the lake. 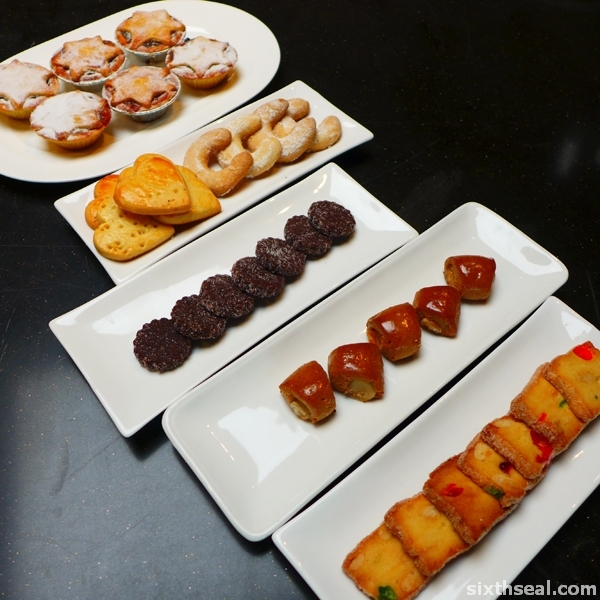 Senja Restaurant is also starting a new tradition of Christmas Day and New Year’s Day brunches with buffet style antipasto and desserts from RM 90++. They can be reached at 03 7843 1234 for reservations. 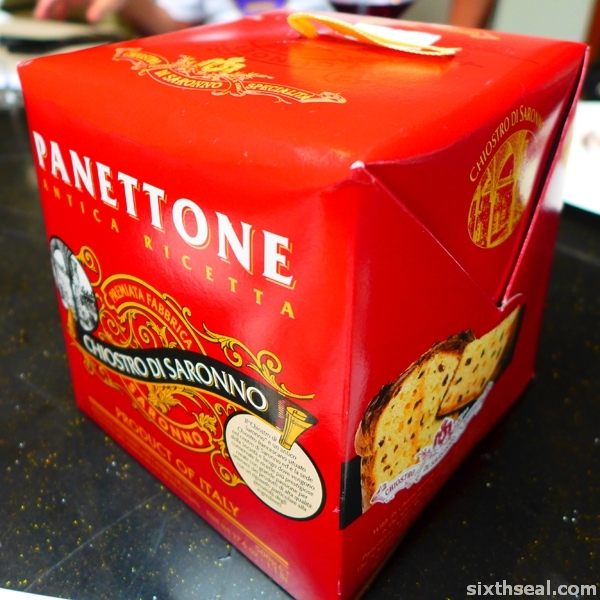 Oh, and they also sell that Panettone cake by itself but it won’t nearly be as good as the one made into “tiramisu”. Heh. 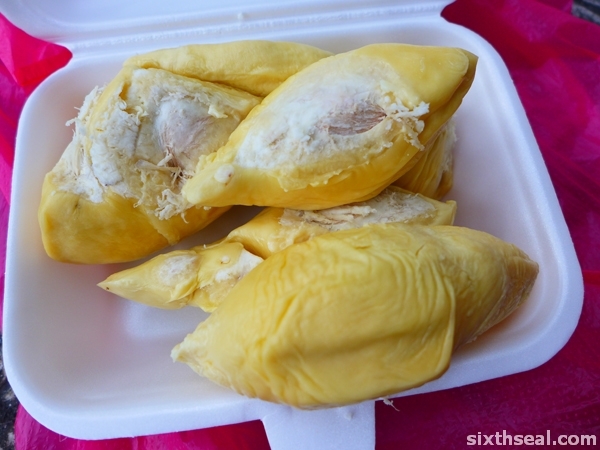 Has anyone heard of a Golden Swallow durian? 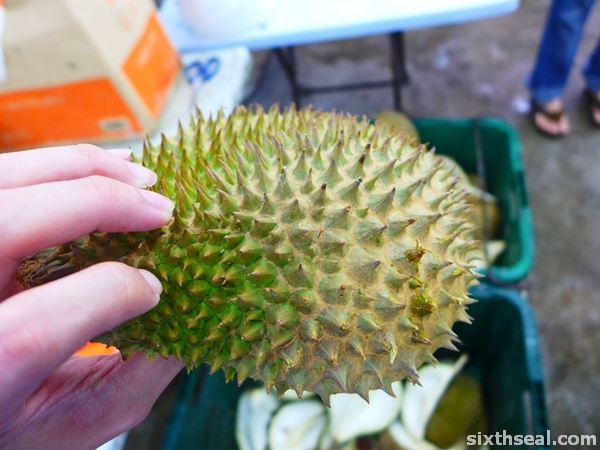 I was out getting some durians when I came across this stall explaining the virtues of this particular strain of durian to an elderly lady. He didn’t pay much attention to me as he made his pitch – it’s called Golden Swallow (jin yan zi) and it’s very popular in Singapore. 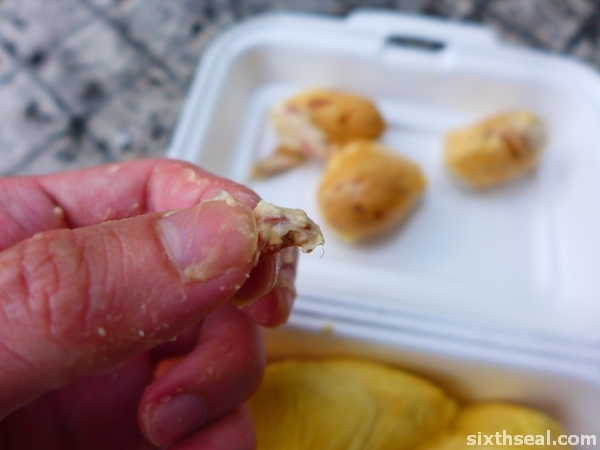 This Golden Swallow durian sounds a little like Golden Phoenix to me (except the latter is called jin feng) and apparently just a few of these babies drop in the orchards each day. 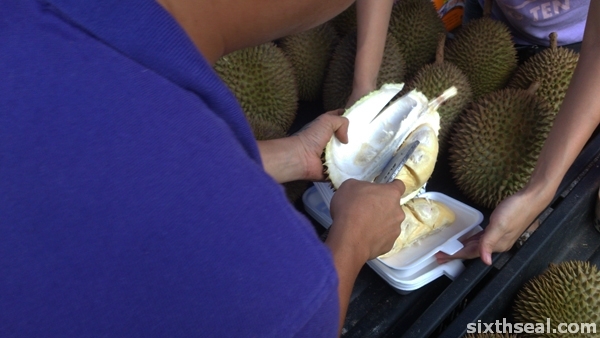 The durian seller only had two and the lady bought one of them. 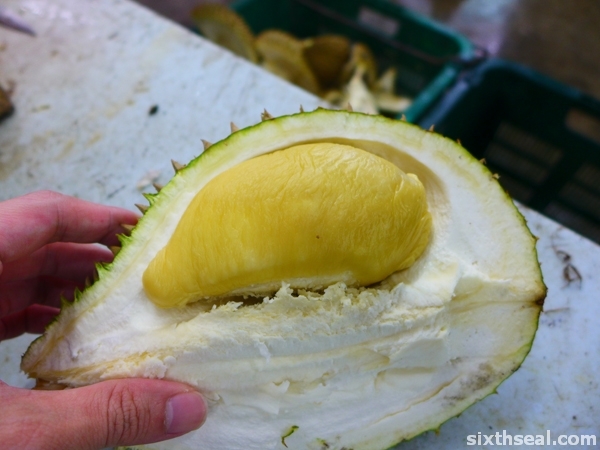 I was intrigued when he opened it up – the flesh looks really good – yellow with a reddish hue and I asked the durian seller how much it was. He quoted me a price of RM 8 / kg which is about the same price as XO strain is right about now. He started doing his pitch again, this time to me, and I told him I heard what he said to the lady. 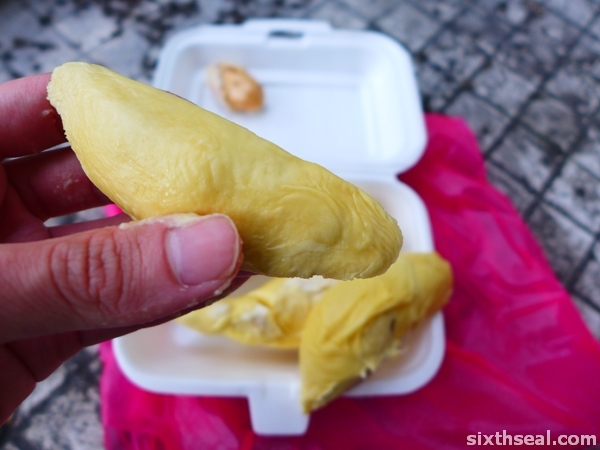 I was more interested in the origins of the Golden Swallow – the dude, named Ah Ti, usually operates out of SS3 in Petaling Jaya and they have their own orchard, from which comes this new durian. Well, it’s new to me coz I haven’t had it before. I told him I wanted two but he said he only had one left after selling the other to the lady and opened it up for my inspection. 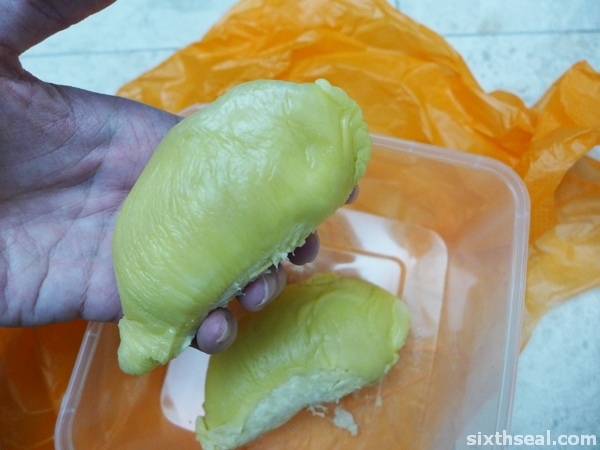 It looks good and I haven’t had a Golden Swallow durian before so I bought the one that was left. 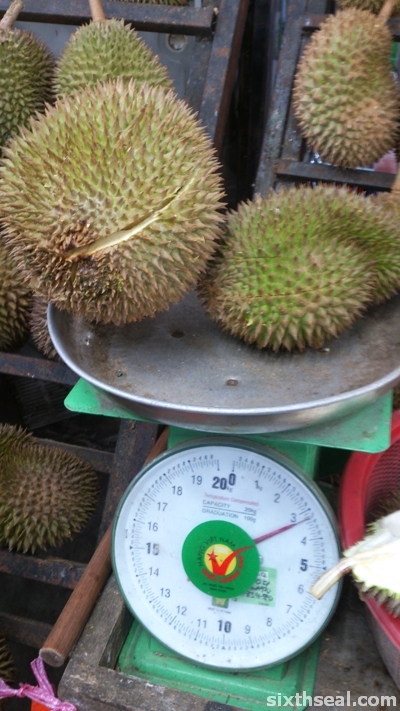 It’s 1.7 kg but the guy gave me a discount and sold it at 1.5 kg – RM 14. It’s the same large-tiny arrangement throughout the segment! I think I might have accidentally eaten that last tiny seed. It’s smaller than my fingernail! 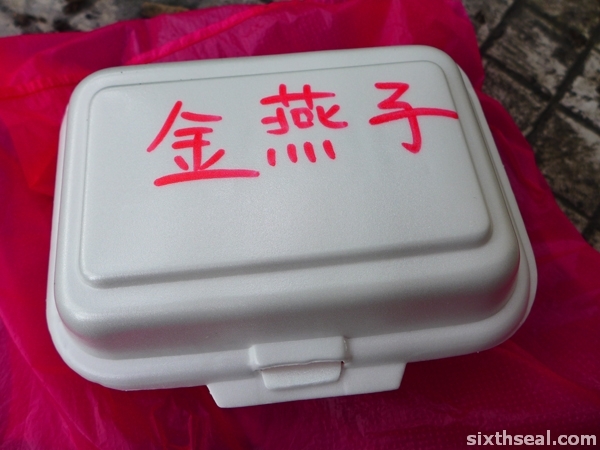 I got the person to write down the name in Chinese for me on the box and I got his number so he can tell me when there’s a fall in his orchard. 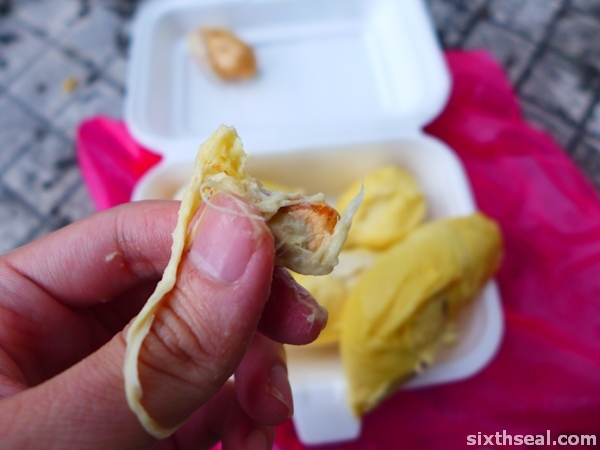 I reckon this Golden Swallow durian is absolute value for money if you like durians with the taste notes above. 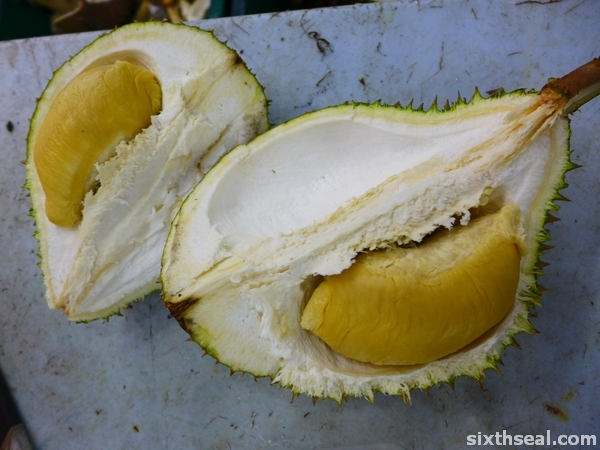 It also has a characteristic huge-tiny seed configuration that’s consistent throughout the entire durian. 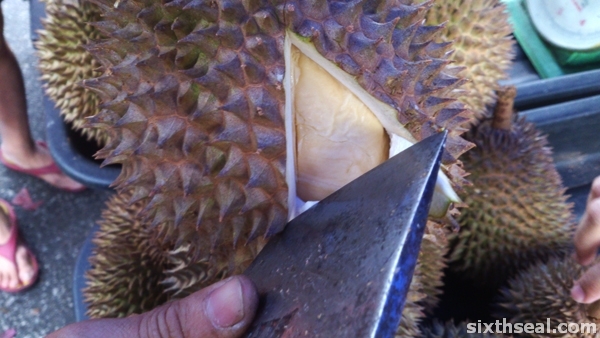 It’s always in a pair – each segment will have one large seed and one tiny one, the size of my fingernail. I can see why it’s called Golden Swallow if the seed configuration is that unique. Has anyone heard of this strain/cultivar? It’s called Golden Swallow and I think the most distinctive part about it is the seeds. Just look at the tiny-large seed consistency in one segment below! 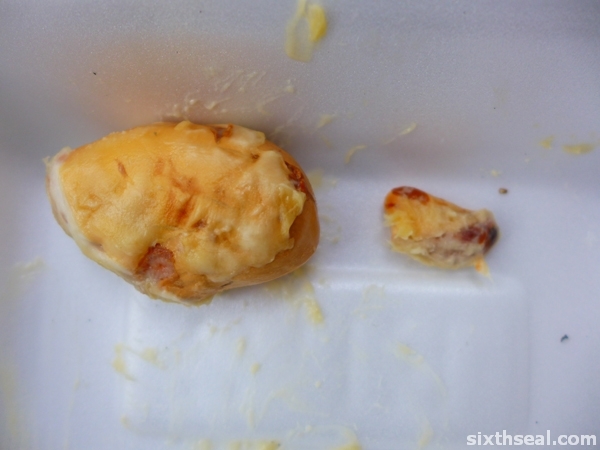 It also has wrinkly skin that barely holds in the deliciously bitter creamy flesh inside. 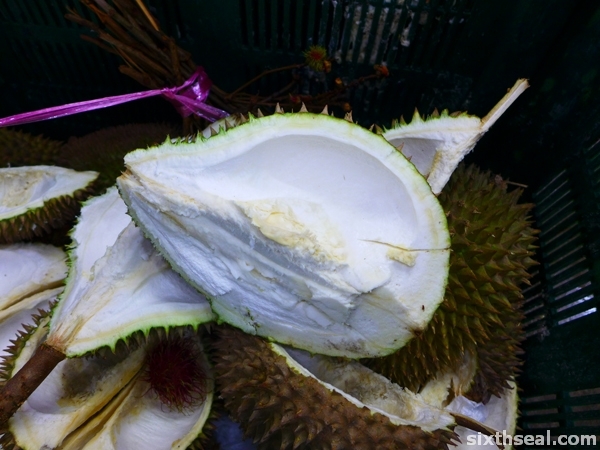 I would definitely buy it again – it’s cheap right now at RM 8 / kg and a truly remarkable durian! I was driving out last night from my place when I had to swerve to avoid a head-on collision with a car coming up at full speed from the exit ramp. * It should be noted that the 90 degree corner separating me from the other car at that ramp is a blind spot – I cannot see him and there’s a difference in elevation so I can’t even see his headlights splash for advance warning. The person inside kinda smiled apologetically at me and then drove off. I couldn’t stop him since my car was still stuck and after extracting myself I went to lodge a police report. The police told me that they can’t accept a report unless I have the other person’s car licence plate. I didn’t. Thus, I went back and went to the security monitors to review the incident. A large problem is that all of the DVRs were all out of sync chronologically and I had to make calculations to see what happened when. The security was of minimal help. I had to do all of this myself, replaying the CCTVs (used to work in the securities line) for over 4 hours! There were two cars entering the car park when I was getting into my car so those two are the obvious suspects. One of them did actually take that dangerous short cut that nearly resulted in me colliding head-on. However, both of the cars were black and not white. I encountered a white car, and it seems like the person driving it looked rather familiar but there is no tenant with a white car coming in at the time. There was also the issue of headlights visible at the far end of the ramp before that, which could possibly be the result of an existing car (e.g. one inside the car park) at the area before Level 2 waiting and then coming up the wrong way. The incident happened at 8:06 pm last night and I spent 4 hours scouring the CCTV footage and the car park for the car to no avail. I had to swerve hard to avoid colliding with that car and in that process, hit the wall on the other side of the ramp. I have a feeling the front compressed into the radiator. I only got back after 12 am and talked in the porridge forum for a while before sleeping. I can’t report this as it is but I’ve spoken to a lawyer and has been advised to keep all my video recordings and evidence for a possible future litigation which has nothing to do with traffic incidents (24 hours). I can’t really talk about the circumstances (you know how it is, in law, it’s always about the other side making a mistake first) but anyway I’ll head out to get a quote from the workshop I used to work with to see how much the car is going to cost me. 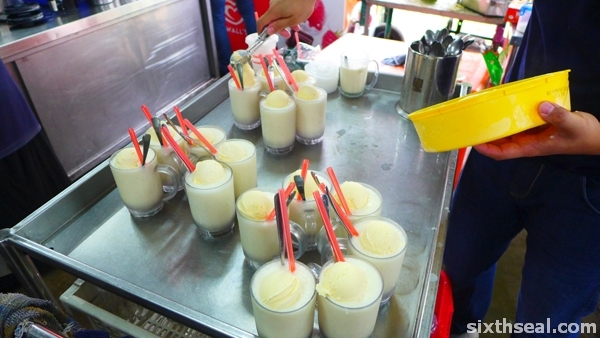 This is a truly remarkable drink – one where people are willing to line up under the hot sun or even in rain for. 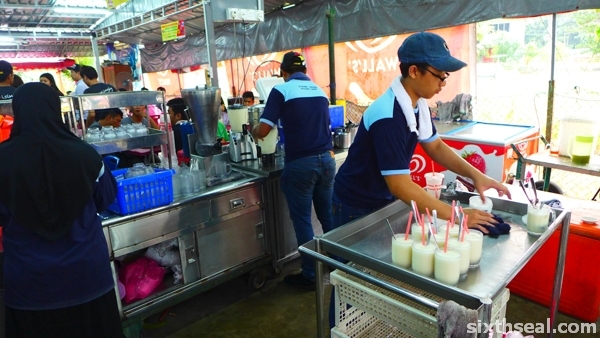 Klebang Original Coconut Shake is located in Melaka – it’s named after the street it’s on (Jalan Klebang). 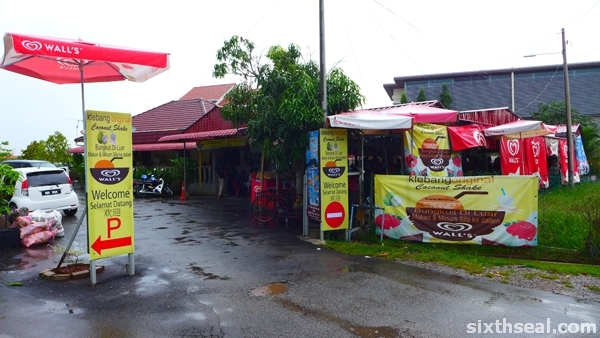 There’s constantly a queue at the small takeaway kiosk whenever we passed it during a road trip yesterday. The kiosk is for takeaways only to free up the main arena for dine-in customers. 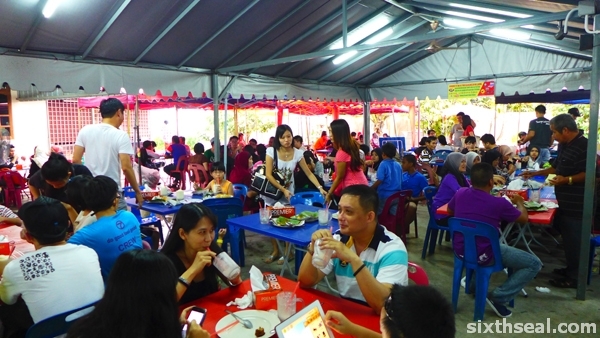 Klebang’s Original Coconut Shake truly deserves the “famous” moniker as the sit-down area is huge, as big as a sports stadium and packed full of people. The car park is equally impressive and despite the constant rain and drizzle, people still come in for a fix. 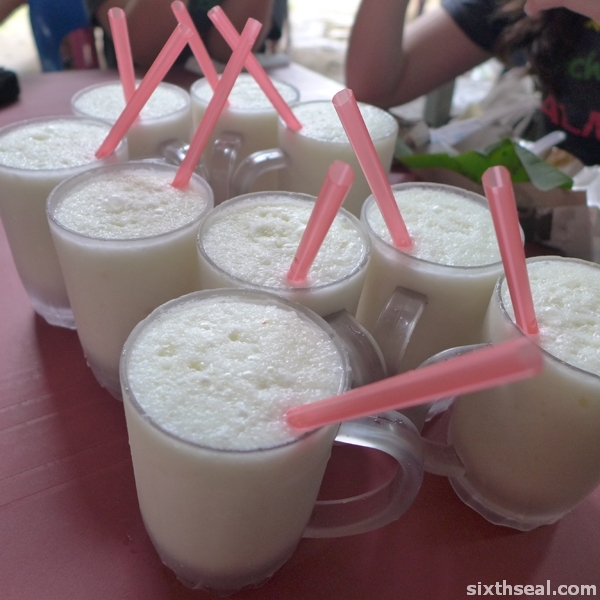 The shake is ingenious – it’s basically an ice blended coconut drink but everything in there is made of coconut. 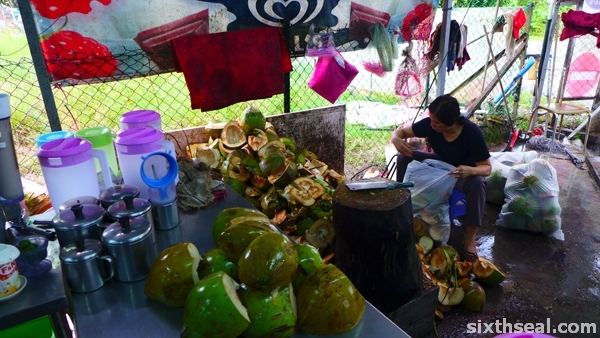 They take coconut water, coconut flesh and ice cubes to blend it all together. Thus, you’ll taste coconut water and bits of the shredded flesh as well as you go through it with the spoon and straw it’s served in. 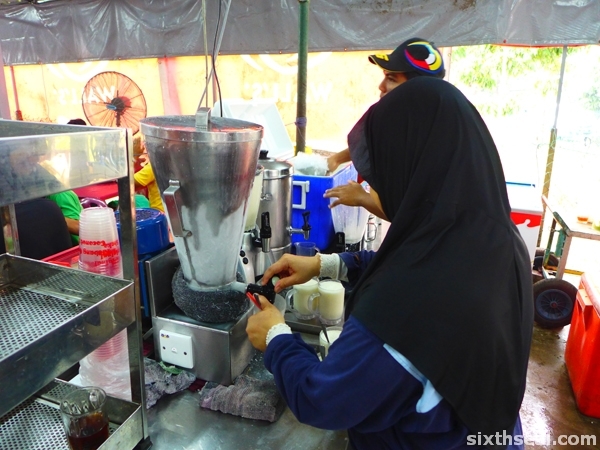 Klebang’s Coconut Shake must go through tons of coconuts every day and I know from observation that they go through several large boxes of vanilla ice cream in a couple of minutes. 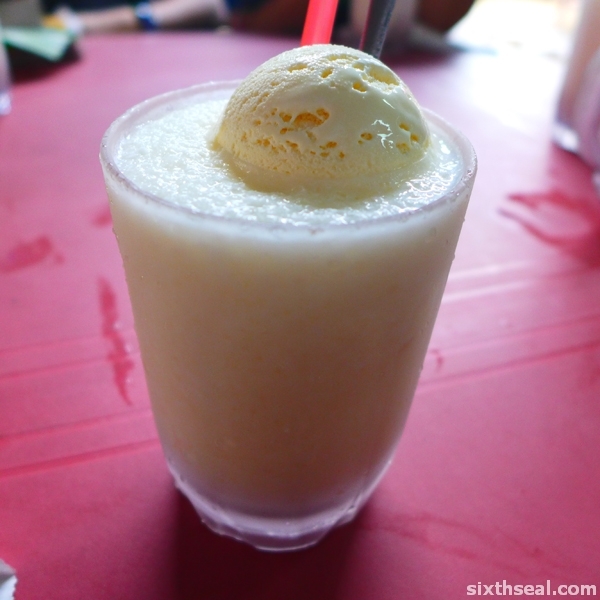 The “special” version of the coconut shake comes with a full, generous scoop of vanilla ice cream and it adds a lot to the taste of the shake. 2. 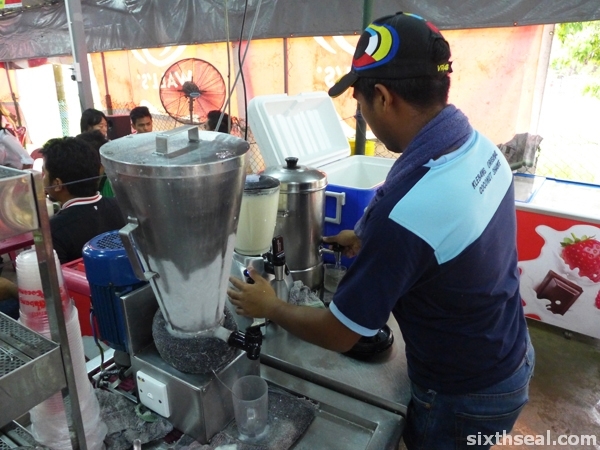 The coconut water and flesh goes to the blending station where it’s ice blended with ice and then loaded into a funnel-like device to churn the blend into a waiting chilled glass. 3. The glasses are then sent into the prep station where it’s either sent out as it is or supplemented with a large scoop of vanilla ice cream for the special version. 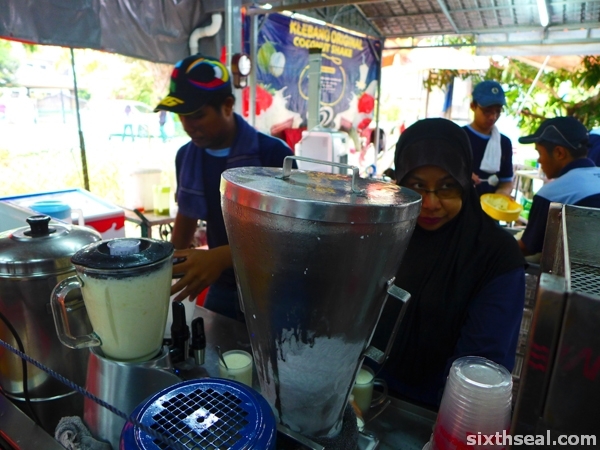 The end result is a delicious coconut shake made almost entirely of coconut and it only costs RM 1.70. 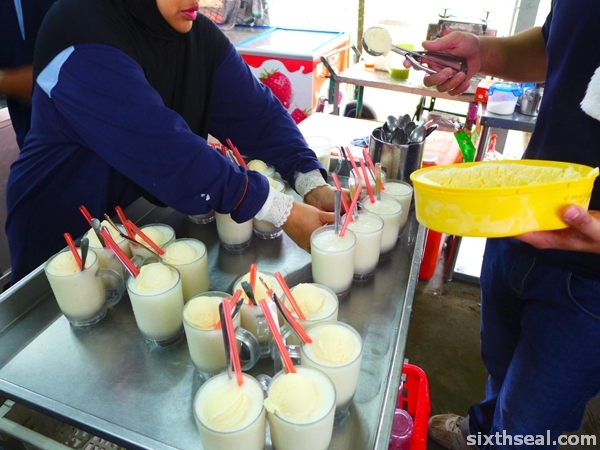 The special version with a scoop of vanilla ice cream costs RM 2.20 – 50 cents more and I feel that adds a lot to the taste – imparting a creaminess than one would usually associate with the word “shake”. 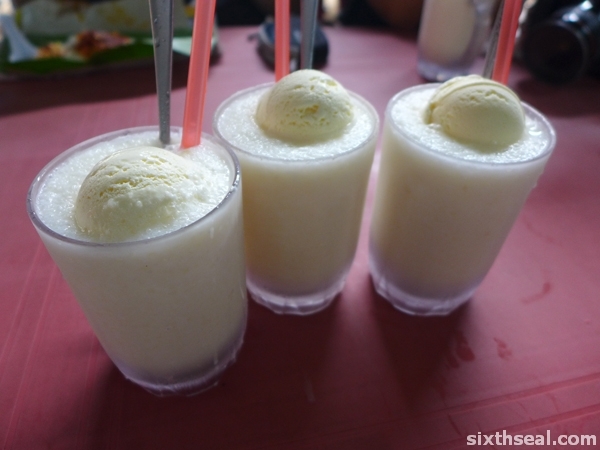 However, the Klebang Original Coconut Shake is a must visit when you’re in Melaka. 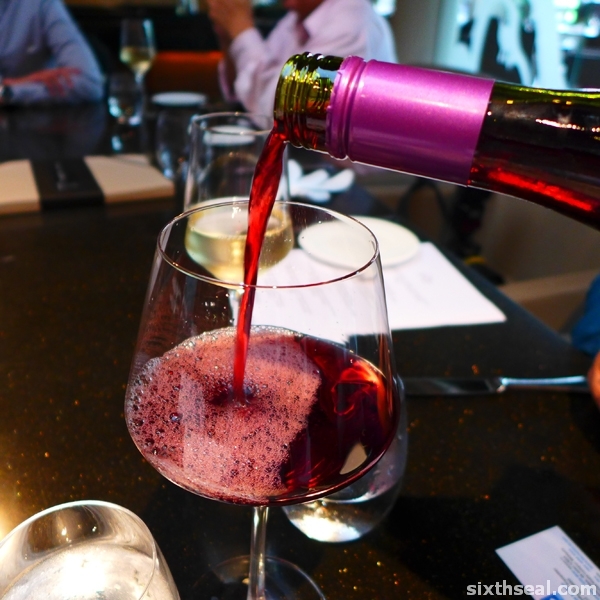 It has grown a lot since the days and some might say it’s a tad commercialized with menus in three (3) different languages but that still doesn’t change the fact that it’s a great product to begin with. They haven’t slacked off since the last time I came several years ago either – each glass of coconut shake is done to perfection and I love how they use chilled mugs even with the rush of a sudden influx of people (which is why you have to queue in the takeaway section). It’s also affordable (most brewed drinks in KL costs way more than that even in regular diners) which is part of the appeal. 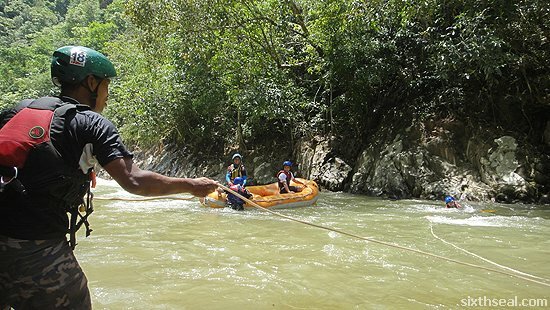 There are so many adventures to be had in Malaysia. 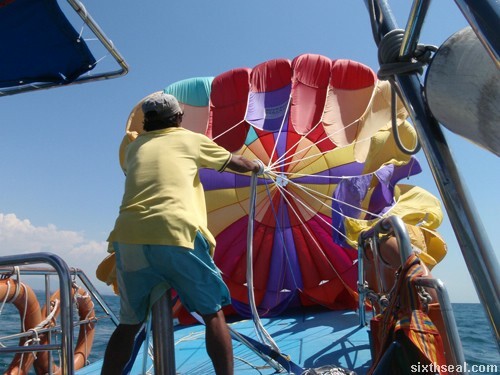 The one above is parasailing in KK, Sabah. 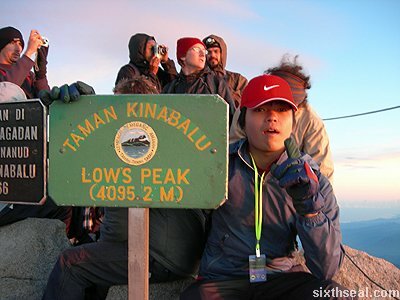 Some are less than an hour’s drive away from KL. I’ve had so much fun just inside my country that I’ve even forgotten some of the places I’ve been and the things I’ve done. 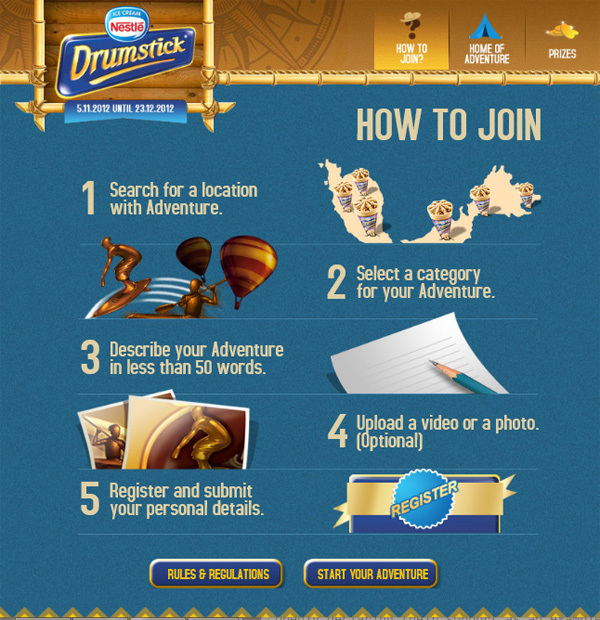 This is where a fun app on Facebook comes in – Nestle Drumstick’s Home of Adventure is an avenue where you can submit your best adventures based on four (4) categories – the ones I’ve included at the beginning. 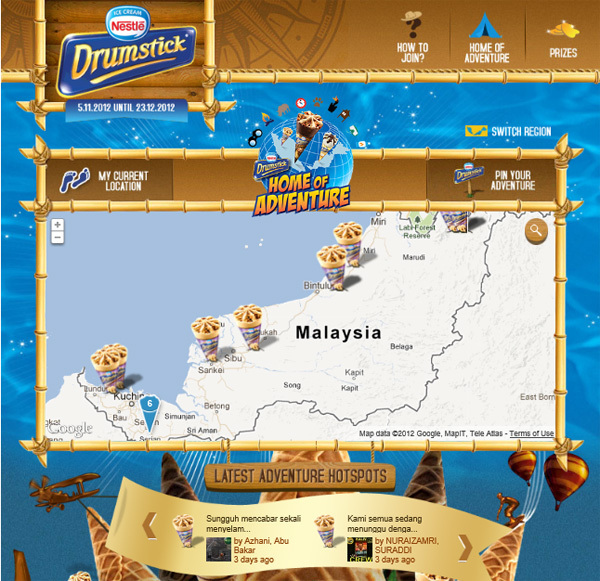 There’s a search function too and you can choose between East and West Malaysia. I’m going to go to East Malaysia coz that’s where I’m from. 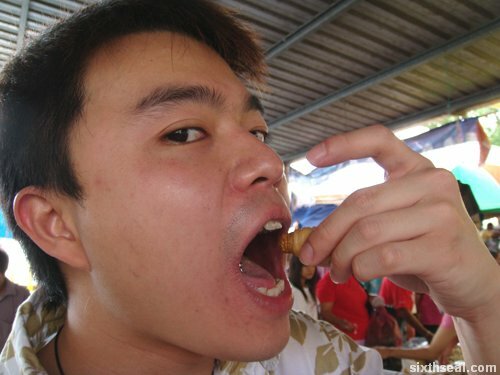 I chose somewhere close to Sibu, where I was born, for Food Travels (with a bit of Thrill Seeker thrown in). I just need to Pin the location and write a simple description. You’ll need to put in your name, IC and cell phone number so they can contact you if you win. It’s that simple! and then there’s an optional feature to add a photo or video. 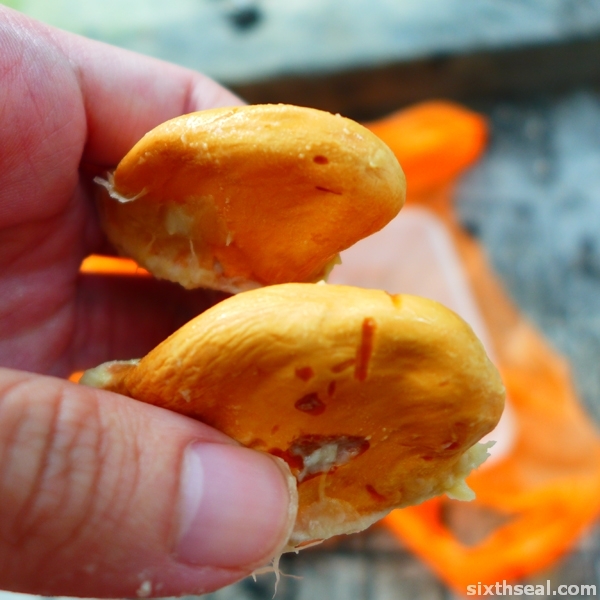 Here’s my sago grub eating video if you’re not too squeamish. Heh.